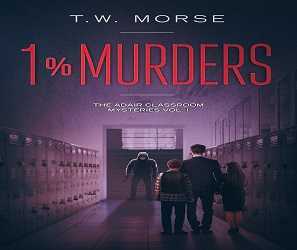 1% MURDERS tells its story through the eyes of Ulysses Adair, a freshman at Mangrove High, and his widowed father, Logan Adair, who happens to be his U.S. history teacher. They are transplants living in the predominantly 1% city of Somerset, Florida. Both Adairs live normal lives. They even play guitar at the local coffee shop, Penny University. However, their everyday lives are turned upside down when a wealthy parent is murdered inside their beloved school. Out of necessity and curiosity, the Adairs become a father and son mystery hunting team. Because of their love of mysteries, they can’t resist the temptation to investigate, especially when the murder hits so close to home. They are aided in their investigation by Ulysses’ no-nonsense girlfriend, Hannah, and Logan’s best friend, Mangrove High’s bumbling physical education teacher Bob Nelson. Logan and Ulysses tirelessly follow the clues, avoiding danger at every turn, even as they get dragged into a deep, dark underworld they didn’t anticipate. Who committed the 1% murder? Ulysses’ horrid geometry teacher, Mr. O’Leary? Maybe the principal? Or is it someone from their past? Everyone's a suspect! Hopefully, the Adairs can solve this case before it’s too late!